Each passing day Morsi's decisions undermine his leadership and that of his group the Muslim Brotherhood (MB) eating away at their legitimacy. What we're seeing is not really a president but a puppet controlled by the MB Guidance Bureau. At best, what we're seeing is a hesitant incompetent president who does not think his decisions through, always backing down, never listening to his people. Morsi declared a state of emergency in three cities despite earlier promises from him and his group that this will never happen and that the law is enough to deal with whatever problem arises. They are fully aware of how this law can be used to fight political opponents. Morsi declared a curfew which people are not convinced off and he backed down on his decision, like he has done numerous times. Police are shooting at people indiscriminately, seldom upholding the law, often following illegitimate orders. This is the police of a dictatorship not a democracy. We've seen protesters killed, incredible amounts of tear gas and more than that, a five star hotel being looted right next to where they were stationed. There is no good reason not to believe that the thugs who attacked the Semiramis were not state sponsored. The public prosecutor is privately owned by the Muslim Brotherhood, never looking into any of their crimes but instead targeting their enemies. Most recently he outlawed 'The Black Bloc' as a terrorist group without any evidence. They released a few youtube videos and have worn masks while attending protests. Worse than that, he asked civilians arrest members of the Black bloc. The judiciary is corrupt, but what Morsi is doing is taking it over rather than reforming it. A very politicized decision in the Port Said Massacre case, and a speech that asks us to accept the rulings of a court he once accused of corruption. Freedoms are regressing, with attacks on media in various forms. Early retirement of Hani Shukrallah, editor in chief of Ahram Online, lawsuits against satirical presenter Bassem Youssef and the targeting of Christians in cases of 'defaming religion' are but small examples to the wider crackdown on freedoms. Meanwhile, Morsi is securing international relationships in order to cement his rule. What will he do with the funds he secures from the European Union? Spend it on security, tear gas and ammunition? There are two ways some sort of stability can be achieved, enough oppression or enough justice. Morsi has opted for the former, much like his predecessor. With the state of the people of Egypt it will have to be much more oppression than that practiced by Mubarak. In my mind I have no doubt that Morsi is willing to do what it takes to silence opposition and oppress the people. But the question isn't whether he is willing, the question is whether he is capable. Another January 25 marked the third year of continued protests in the hopes of finding our way to a successful revolution. On Friday, I joined the Shubra march to Tahrir Square where I saw many the familiar faces along with many other protesters once again. This was not like last year’s march. This year there was certainly less energy and even less cohesiveness in the very long march that extended along Shubra’s streets. The street was laden with pockets of protesters. The pockets could be identified from a distance along the road by the endless density of flags. They were flags of 6 April Movement, Revolutionary Socialists, and the big white flags with the iconic faces of the martyrs of the ongoing revolution, including Emad Effat, Mina Danial, Jika, and now added to that list was Al Husseiny Abo Deif, the al-Fagr reporter who died in the Ittihadeya clashes last December. 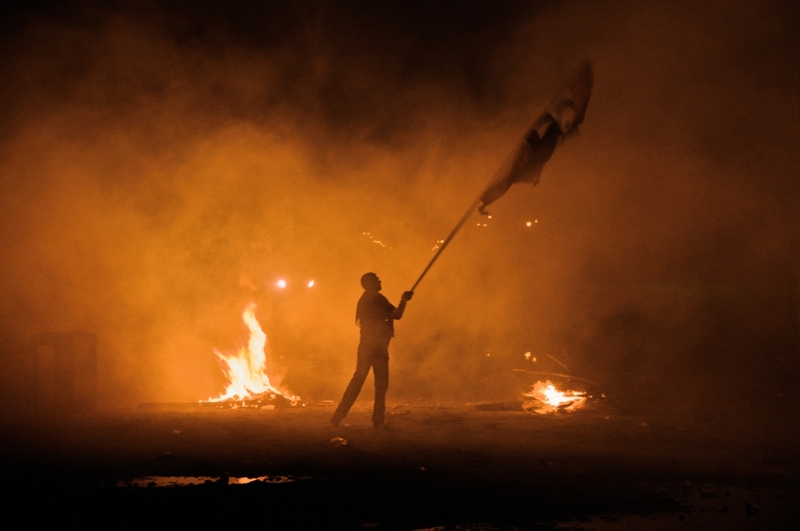 The sentiment across Cairo, and perhaps across all of Egypt, is that protesting is no longer enough. Two years into the revolution and the prospects of bring about meaningful change through peaceful protests are slowly diminishing. With virtually every promise made by President Mohamed Morsi and the Muslim Brotherhood (MB) to the public or to opposition broken, it seems that dialogue is not yielding satisfactory results. The leaders of the National Salvation Front (NSF) set up by Mohamed ElBaradie, Amr Moussa and Hamdeen Sabbahi seem aware of this reality, but are unable or unwilling to take a more confrontational stance against the current regime, thus falling far behind a more radicalized street movement. The list of broken promises is too long to review. One notable promise that the MB betrayed pertains to producing a constitution through consensus and an inclusive constituent assembly that represents all factions of Egyptian society. Broken promises and lies have been so widespread and flagrant that a popular campaign Kazeboon (Liars) was re-launched to expose the MB’s lies through street screenings organized by citizens, movements and parties. Disenchantment with the ruling party and the formal opposition is reminiscent of the Hosni Mubarak era. Yet this time around independent actors are more willing to take matters into their own hands and do something about it. That perhaps explains why the protesters were not as energetic as they used to be in their chants against Morsi, the MB’s rule and the constitution. The hopes are no longer riding on chants and marches. Instead, hope seems to be riding on groups willing to escalate and adopt more adventurous tactics, such as the Ultras who blocked the metro for a few hours last Wednesday, and later on the same day, the vital sixth of October bridge. The Shubra march featured one group that has been the subject of interest for many protesters in Egypt in the past two days, namely the Black Bloc. The group is comprised of young protestors who cover their faces in ski masks or scarves. The Black Bloc released a statement identifying their purpose as standing up to the “fascist oppressors” the Muslim Brotherhood. They have also warned the Ministry of Interior not to get involved in the fight between the people and the Brotherhood. The group has no official presence on social media networks It is unclear whether they had a role to play in skirmishes between marchers and what appeared to be Muslim Brotherhood personnel near the Ikhwan Online offices in Tawfikeya. Rock throwing was exchanged between the two sides, but eventually the march proceeded normally. Absent from the protests was any presence by the Muslim Brotherhood, which remained largely silent about the protests. Similar to their predecessors among the Mubarakists, they seem to have left their political problems for the police to handle on the streets. When clashes ensued the police used more potent teargas this time, as if, as popular allegations go, ineffective teargas was the reason Mubarak was toppled. While in Tahrir Square the night of 24 January, the effects of the gas seemed more extreme than previous times I had experienced it, even though the canisters were often a long way off. At some point in the afternoon, protesters made their way up the sixth of October bridge and blocked all traffic. Tahrir Square exhibited the usual duality in these types of situations, wherein the vast majority of the people stood in one area, leaving a select few at the front lines of confrontations with the police. As we headed to the protests near the State TV building in Maspero security forces fired at us excessive amounts of teargas, even though provocation was not apparent. The more they fired, the louder and more energetic the chants became. Protesters’ tactics seems to have shifted towards direct action such as blocking vital means of transportation and occupying government buildings. 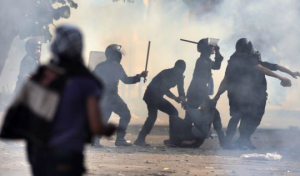 There have also been talks of picking up arms, or at least investing in equipment that could serve to protect protesters from the brutal attacks of security forces. With the policing establishment inherited from the Mubarak era left unreformed, the vast majority of Egyptians believe that the police sole purpose is to serve the interests of the rulers rather than protect the innocent and uphold the law. From the perspective of the regime, Tahrir Square seems to be the safest place for protests as it is not in the immediate vicinity of any of the vital buildings such as the Giza or Cairo governorate buildings, State TV, or parliament. More importantly, is far away from the main MB headquarters in Moqattam. The protesters’ fixation on Tahrir square in Cairo seems to be more of a setback than an advantage. Many protesters in other governorates, such as Mahalla, Ismailia andSuez, have already stormed government buildings and police stations. Cairo’s protesters are unable to follow suit due to heavy security presence and the location of Tahrir Square. As the clashes continue, the Brotherhood and its supporters will continue to label their challengers hired thugs. For anyone on the ground, however, it is clear that these are not thugs, but revolutionary youth enraged by the feeling of being cheated out of the revolution they deserve. I’ve long been accustomed to writing grim posts on special occasions even from before our special occasions turned grim by nature. Now all we have are the grim occasions to commemorate rather than celebrate, the death of our fallen heroes or their birthdays. In the past two years, life was on fast forward. Each day brought new calamities and once in a while there were small victories. Anyway, this post is about the New Year. I’ve long celebrated it with caution, and never more so than this year. My thoughts travel to many different places in the past and in the future. They’re both part of one another and this day does not separate them. This is just an arbitrary point in time to look back at the past and look forward to the future as you ride that wave that turns one into the other. I have nothing more to say about New Year and its resolutions than I’ve said in the past. I’ve made the ultimate new year’s resolution that everyone does and no one ever keeps. I find that the one thing worth looking into is the past, not to weep over it but to learn from it. Maybe by looking honestly into it, I can help with what’s to come more than all the haughty resolutions few people tend to keep. The sad things is that the new year caught me at a time when I’m unable to make a formidable assessment. Am I a better person for all that I’ve seen and all that I’ve stood for? I don’t know. I’m enough of a realist to entertain the notion that perhaps all that has happened has only worn me down. I’m not yet bouncing back and I don’t know anymore if all that has happened will allow me to. I’ve stared injustice in the face. That’s my obsession now, injustice. I don’t want to see it, but it follows me everywhere. The biggest problem is that it’s systematic. It’s not just isolated cases. I’m living in a country where avoiding it is a fluke. The system is set up so that injustice prevails. That is what’s wearing me down. I have become a lot more emotional. I’m not one who has much empathises much. In fact, someone once jokingly said I must have ‘blunted affect’. Yet my tears have become closer to my eyes than before. It’s not a movie we’re watching with actors playing heroes, it’s the real deal. It’s the young people brave enough to believe in ideals we’ve encountered in books or movies or deep within ourselves that move me. It’s not a video game and there aren’t always cameras rolling, but I’ve seen people armed with nothing but their ideals and the occasional rock stand up to guns and foreign funded weaponry. I’ve seen faith in freedom fuelling the bodies of young and old through long hard days where hope is elusive. I’ve heard the chants and the flags waving tirelessly in the face of hard hearted criminals that betray their sworn duties. These are the things that make me cry. All of this is real. This is what they’ve tried to capture in books and films, but we’ve captured it in reality. Has all this made me a better person? Perhaps not, perhaps it made me a weaker person. I’ve never believed that what doesn’t kill you makes you stronger, maybe it just makes you weaker and wears you down. I’m not the same person I used to be. I’m a little more irritable, sensitive, argumentative and impatient. I haven’t been able to deal well with my rejections and find my peace because of all that has been happening around me. I long for moments of peace when I can find my old serene self that took me through the many hardships I faced. I feel there’s someone buried deep inside with the power to turn all the bad into good, but I’m gasping for air and cannot find that shore on which to rest and recover before I continue swimming. I don’t know if this is something that will last, I have this faith within me that that buried person will re-emerge from the depths and make sense of all of this. This is not a book I’m reading, this is life and this is real, maybe that’s why it’s difficult to know what I’ll do with all of this, because it’s so raw. No one transformed it into words, no one transformed it into music, no one transformed it into pictures. These genuine times are more confusing than what we’re told to believe and see. The evil as real as the good. That confrontation with both is taking its toll on me. This is real life, no guarantee that good will prevail over evil. One thing in the fantasy resembles reality though, good is beautiful and evil is ugly. They never capture it well though, the beauty of good people, with all their flaws and imperfections, trying to do right by themselves. And the ugliness of evil people, with their insistence on squandering all their chances, and truly hurting millions around them selfishly. The goodness seeps inside your bones and moves you to tears. The ugliness clouds your days and enrages you enough to reconsider everything you’ve been told.